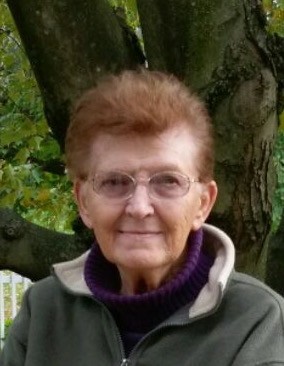 Ann ‘Joan’ Principe passed away peacefully after a brief illness on Friday, February 1, 2019 at Pinecrest Manor. Joan was born August 17, 1933 in Ridgway, PA to the late Edward Carlson and Theresa Buehler Carlson. She grew up on Grant Road with her dear sisters Linda (Streich) and Robyn (Carlson), who was welcomed into the family many years later. Both sisters preceded her in death, along with a niece Kara Ann Carlson. Joan was a graduate of Ridgway Area High School, class of 1950. She worked at the down town Market Basket where she met her husband Ben, then later worked at the Elliot Company where she shared some great times with many of her best girlfriends. Joan is survived by her husband Urbano ‘Ben’ Principe who she married July 11, 1959 at Faith United Church of Christ in Ridgway, PA. After their marriage, the couple lived briefly in Warren, PA then settled in St. Marys where they stayed to raise their family. Joan is also survived by her two children. A son Tim and his wife Colleen of Chantilly, VA along with their two sons, Shawn (Bayer) and Alex. A daughter, Tami, and her husband Martin Weis along with Tami’s three children, Nicky, ViviAnne and Angelo Catalone, all of St. Marys. She is also survived by one sister-in-law Dorothy (Jim) Prencipe and many loving nieces and nephews. Joan could usually be found in on of two places, depending upon the weather. In the warmer months, she could be found in her flower garden in the back yard and in the winter, Joan was sure to be found in her art room in the back of the house. No matter where she went, there was usually a cat or two following close behind. She also enjoyed spending time at the family camp at Bear Creek, taking walks and picking apples or flowers. Joan was a dedicated volunteer at the Resale shop in St. Marys for many years and enjoyed visiting the Humane Society every so often to drop off goodies for the cats, always wanting to take a few of them home. She will also be remembered for her drawing, painting and unique ‘cloth collage’ artwork. Joan won countless awards throughout the years, one of her proudest being from the Brockway Fourth of July Celebration. Her picture “Lilacs” earned the title Best of Show and hung in the Brockway library for one year, alongside a plaque and a brief article of her art career. Her talent was a gift she will forever give back, as many of the subjects of her pictures were her parents, children, nieces, nephews, and grandchildren. A service celebrating Joan’s life will be held on Saturday, February 9 at 11:00 AM at Thompson Funeral Home in Ridgway, PA. Pastor Stephen Fair will be officiating. In lieu of flowers, donations can be made to the Elk County Humane Society.